Macaws were once nearly extinct in Costa Rica – we were told there were more pet Macaws in New York City than in the wild in Central America. Since 2005, isolated populations of Scarlet Macaws in Corcovado and Carara National Parks have expanded into healthy flocks the entire length of the Pacific Coast. The great green macaw (Ara ambiguus) is still critically endangered but making a remarkable recovery with the unexpected help of an ecological invader. 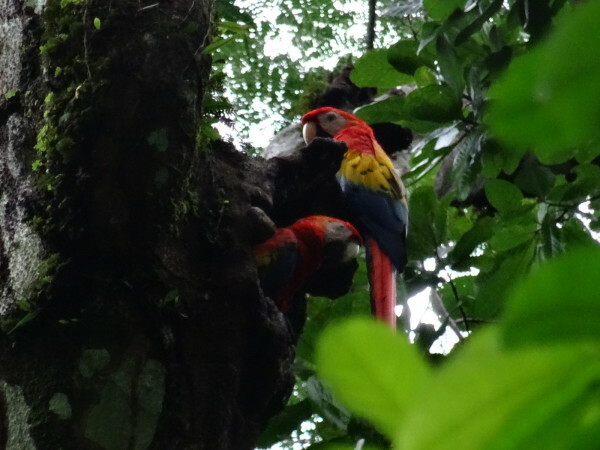 Laws were passed in Costa Rica prohibiting caging macaws and other rain forest birds as pets and a remarkable recovery has been driven by breeding and reintroduction projects by organizations like Zoo Ave and The Ara Project. Scarlet Macaws feed on seeds, fruits, leaves, flowers and bark of dozens of tree and plant species that grow in Costa Rica’s coastal forests. Large flocks roost in the mangrove forests at sunset then each morning fly inland soon after sunrise to feed . Oddly they’re very fond of Indian food – specifically the seeds of the Indian beach almond (Terminalia catappa, Combretaceae). The almond is an exotic species (not native) but well established along both coasts. It’s very common along a 50 km stretch of beach centered on Jacó from Tarcoles in the north to Parrita near Manuel Antonio on the south making this one of the best places in Costa Rica to spot scarlet macaws. We felt incredibly lucky to spot the rare sight of a pair of Ara macao cyanoptera tending to their nest in the wild in the mountains above Tarcoles. Scarlet Macaws on their nest. They have incredibly strong beaks and are one of the only birds that can excavate a nesting cavity in a living tree. Green Macaws are larger than their red cousins but still easily recognizable by their unmistakable silhouette hooked beak, long tail and of course their raucous call. 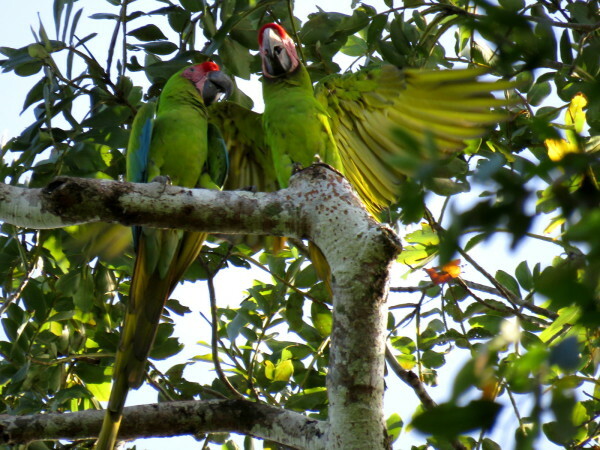 For centuries, green Macaws relied on a single species of mountain almendro (Dypterix panamensis) trees for most of their food and nearly all nesting sites. Unfortunately the wood of the mountain almond is good for construction and the trees have been logged nearly out of existence in Costa Rica. In the ’80s and ’90s the fate of the birds seemed grim as suitable habitat was also being destroyed to plant pineapples and bananas. Enter the humans and the introduction of an invasive species. Sometime in the late 1800’s or 1900’s people transported sea almond trees to the Americas from South East Asia. They quickly established and spread to become one of the most common trees along the high tide line in Costa Rica. 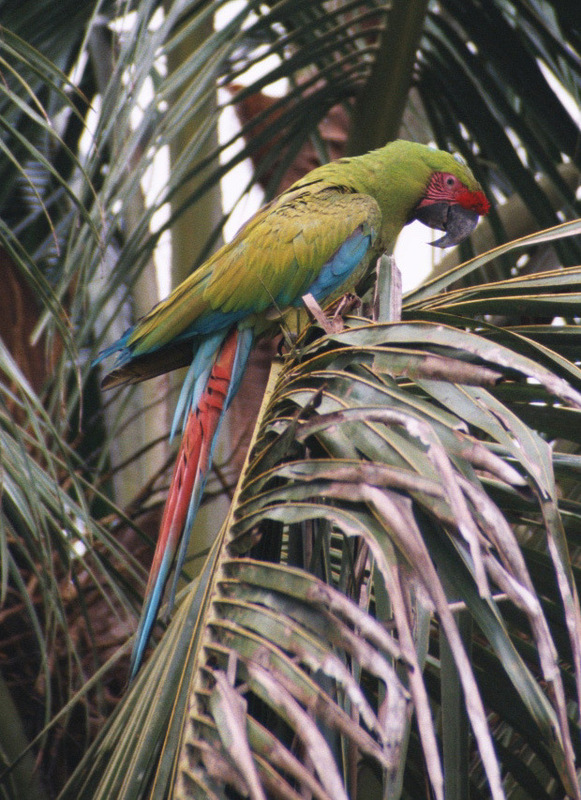 As mentioned above this exotic import became one of the preferred foods for the Scarlet Macaws but for decades the green Macaws continued their native feeding behavior – flying inland to eat mountain almonds. In October of 2016 it had been almost 20 years since we’d seen a green macaw in the wild and we’d never seen one in Tortuguero. While kayaking on one of the aquatic trails we were shocked first to recognize their call then seconds later to see a flock of at least a dozen flash across the narrow strip of blue sky overhead. Our guide told us a story we’d hear many times over the coming days. A few years earlier a pair of green macaws had been spotted eating beach almonds. The story goes that they taught their offspring and by around 2014 the behavior spread to the general population. The number of birds exploded when they switched from relying on the logged out nearly extinct mountain almonds to the invasive but rampantly abundant beach almonds. 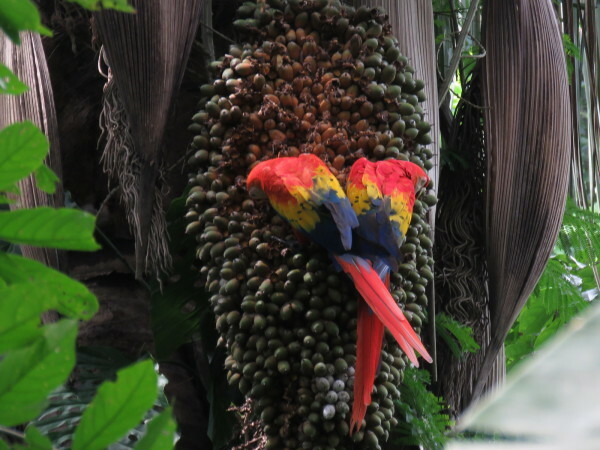 We saw well over a hundred green macaws over four days in the region from Tortuguero to Barra del Colorado on the Nicaraguan border and inland on the Río Suerte. What was once one of the rarest and hardest to see tropical birds is now almost a guaranteed sighting in the area. Costa Rica may be the best place in the world to see the green macaw and there are efforts under way to plant mountain almond trees and perhaps establish a new protected area called Maquenque National Park in the north central lowlands of Costa Rica between the Río Sarapiquí and border with Nicaragua at the Río San Juan. We’ve seen thousands of scarlet macaws but have only been fortunate enough to see green macaws a handful of times.